After the bridge burning, a tugboat, “Columbia,” was used to tow the canal boat across the river. In 1868, yet another replacement covered bridge was built, but was destroyed by a hurricane in 1896. The next bridge, the Pennsylvania Railroad Bridge, was an open-air bridge constructed of steel, and carried the tracks of the Pennsylvania Railroad and a two-lane roadway for cars. It was dismantled for scrap by November 1964. Its stone piers, which supported the Civil War era bridge, can still be seen today, running parallel to the Veterans’ Memorial Bridge on Route 462. The piers have become the site of present-day “Flames Across the Susquehanna” bridge-burning reenactments sponsored by Rivertownes PA USA. By the mid-1800s Columbia had become a busy transportation hub with its ferry, bridge, canal, railroad and wharves. It was a major transshipment point for lumber, coal, grain, pig iron, and people. Important industries of the time included warehousing, tobacco processing, iron production, clock making and boat building. some of the local industries were the Ashley & Baily Silk Mill, The Columbia Lace Mill, and H.F. Bruner & Sons. Trolley service for the borough and the surrounding area was established in 1893, allowing Columbians to take advantage of economic opportunities in Lancaster and other surrounding towns. Between 1830 and 1900, the Borough’s population increased from 2,046 to 12,316. From about 1854 to 1900 an industrial complex existed in and around Columbia, Marietta and Wrightsville that included 11 anthracite iron furnaces and related structures, as well as canal and railroad facilities servicing them. By 1887, that number had grown to 13 blast furnaces operating within a three-mile (5 km) radius of Columbia. The furnaces, which produced pig iron, exemplified the technology of the day through their use of anthracite coal and hot blast for smelting iron ores, a process that dominated the iron industry briefly before the widespread use of coke as a fuel. Since northeastern Pennsylvania could supply a rich source of anthracite coal to areas which had none, anthracite-fired furnaces, using locally available iron ores, were built throughout eastern Pennsylvania, helping make the state a leader in iron production in the latter half of the 19th century. Lancaster County also became a leader in pig iron production during this time, with the complex of furnaces in the river towns contributing significantly to its output. In 1875, a new three-story grand town hall was opened, featuring a second-floor auditorium that seated over 900 and was used as an opera house. The second floor’s ceiling was higher than those of the first and third floors, and each level contained 60 windows. The building also included office shops, council chambers, storerooms and market stalls. 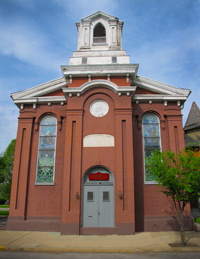 A 140-foot (43 m)-high bell tower, holding the town clock, crowned the building. The clock was visible from all over the borough, and its bell was audible throughout the surrounding countryside. The building was destroyed by fire in December 1947, but was rebuilt as a one-story municipal building that exists today.